Most people recognize this phrase, although possibly without realizing its origin. It came about during Apollo 13, when an oxygen tank exploded en route to the moon, leaving the spacecraft crippled and sending NASA into a flurry of activity to get the three crew members back to Earth safely. One of those men was Jim Lovell, who we interviewed earlier this year (you can check out our posts on that here and here). One of the others was Fred Haise, who we interviewed this Sunday! 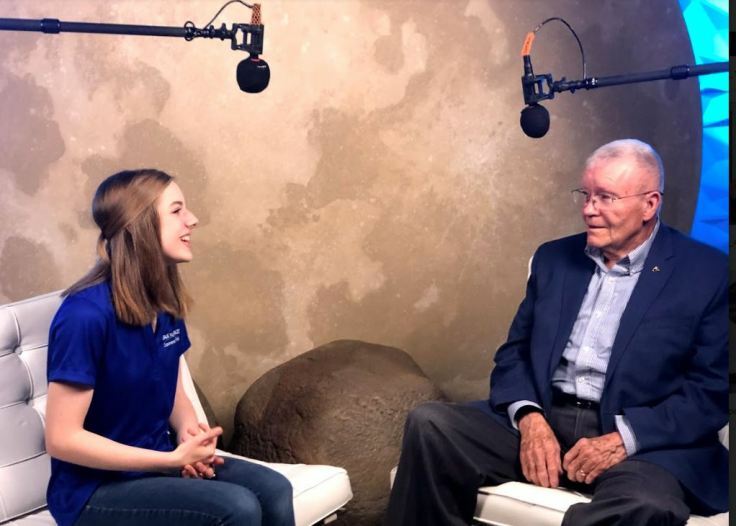 Ambassadors Julianna Lenington, Katie Mulry, and Lance Gorton met with Fred Haise to learn more about his life and the Apollo 13 mission. Julianna conducted the interview. Here’s what she had to say about it! Q: What was your favorite part of the interview? A: For me, the interview was a life-changing experience, especially being able to meet Fred. 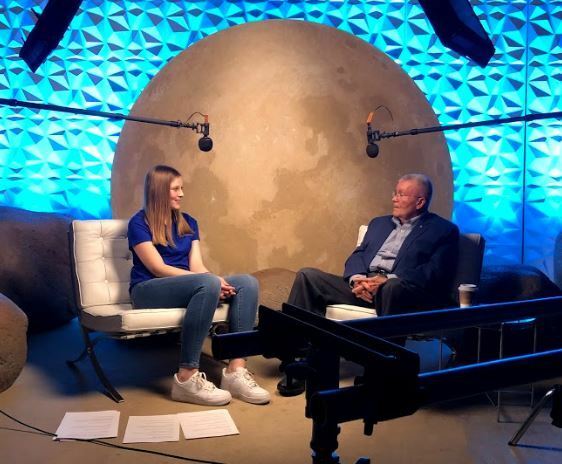 Getting to ask questions over a pretty publicized mission to the astronaut who actually experienced that gave me a new viewpoint on the space program. Q: Did anything Fred Haise said surprise you? A: He told me that he was working to become a writer and art student in college. Q: He was pretty friendly and casual, right? What did he ask you to call him (and what did you think about that)? Q: The interview took place in a prop closet where they store movie set pieces for people to rent. Talk about the location/set– what was that like? A: It was such a cool set, especially with the moon and the textured background. It added so much to our video and will add lots of umpff to our YouTube channel. Q: Were you nervous to do the interview? A: VERY!! I did lots of preparation but nothing could compare to the real thing. Once I started though, I became more relaxed and more confident in front of everyone. Q. Social media users on Reddit and Instagram supplied some questions that you answered, but how else did you gather your questions? A: I did a lot of research and whenever a question came to my head, I wrote it down. I finished with 15 pages of questions! Q: What was the first question you asked him? Q: What was the final question? Q: What stood out to you the most about the interview? A: How friendly Fred was during the interview, and his willingness to answer the questions. As for me, it was fascinating to even just watch the interview. It was interesting how different everything was from my interview with Captain Lovell. The setting, just as Julianna mentioned, was fun and exciting– a nice youthful contrast to the picturesque library from the previous interview, although I loved both places. There was definitely more energy with the moon set! Someone had actually hand-painted the moon in the background, and we were able to sit on the moon rocks placed around the chairs. There were other set pieces around, too– a whole office setup with fake photographs for imaginary people, a bunch of bikes, and a couch by a window looking out at the banks of the Trinity River. There’s so much behind-the-scenes work that goes into these interviews, and those off-camera moments are actually some of my favorites. The camera crew explained to us that the camera dolly they used has skateboard wheels to roll smoothly; they had to find a washer to adjust the camera height and creatively make it all work, which they connected to STEM and engineering solutions. Off camera, Fred told us that he grinds his own coffee beans every morning. 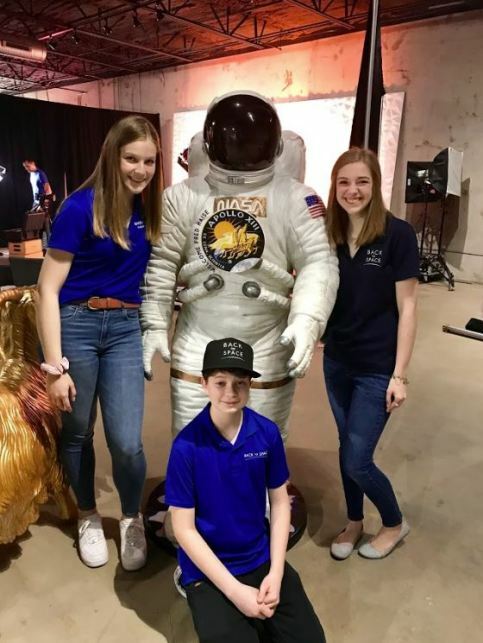 He still lives in Houston near Johnson Space Center, and during the summers he’ll help out with NASA Texas High School Aerospace Scholars. I was in HAS, although not during the week he spoke at, so that was an exciting connection to make. He also works with the Astronaut Scholarship recipients and told us about the research they do, admitting that a lot of it goes over his head. He said he doesn’t ever get sick of telling these stories. As Julianna mentioned, he wanted to be a writer when he was younger. I was the same way– I wanted to be a novelist before I realized how much I loved science. I asked him about it, and he told me that he worked with a newspaper office for two summers. One was with court reporting, and there was a murder case he reported on where he wasn’t allowed to see the crime scene. Fred Haise ended up in aerospace because he wanted to support the country during the Korean War. He graduated high school early, at sixteen, and the Air Force wouldn’t take people that young– but the Navy would, so he became a naval aviator. The first time he flew in a plane was actually at training, and he described it as magical. Listening to his obvious excitement while he talked about that first flight, even all these years later, just made me smile. We all greatly enjoyed getting to speak with Fred Haise and listen to his stories. We shared it on YouTube Live and will be making videos with all of our footage, so be on the lookout for that! If you’ve got other questions for future interviews, comment, email, tweet, message on Instagram, Tumblr, or Facebook, or use the hashtag #B2SInterviews and we can try to get it answered!